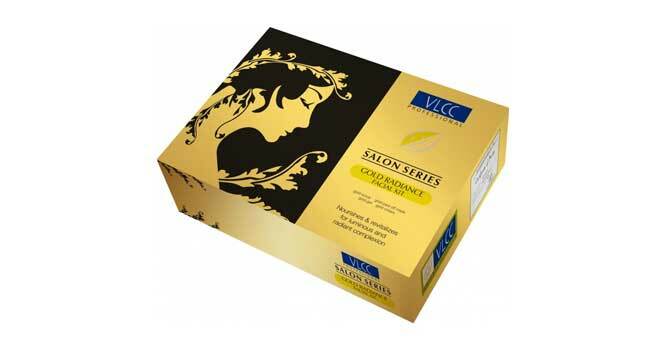 VLCC Gold Facial Kit: This kit, priced at Rs. 1,200, can be used for 6 facial treatments. It has an anti aging formula which helps rejuvenate your skin and fill up fine lines. It neutralizes sebum production to give your skin a fine afterglow. It also gives you an instant luminous glow. It helps to remove dead skin cells, deep clean your skin, moisturize it and trigger deep rejuvenation. 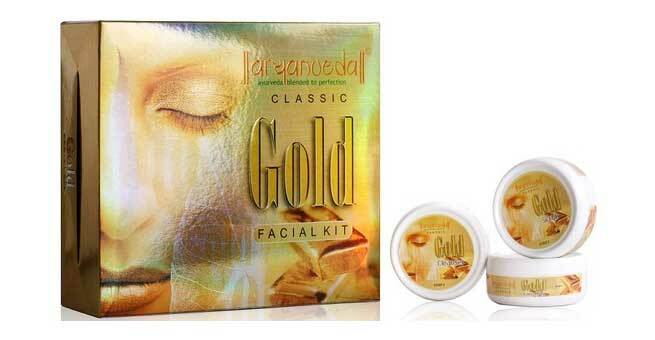 Aryanveda Herbals Gold Classic Facial: This beauty kit that contains a cleanser, scrub and face pack, is priced at Rs. 730. This gold facial is made with 100% Ayurvedic ingredients that penetrate quickly into your skin and rejuvenate it. The ingredients deep cleanse your skin and nourish it to the core. Its priced at Rs. 630. Oxyglow Gold Facial Kit: Oxyglow has been coming up with very innovative skin care products. 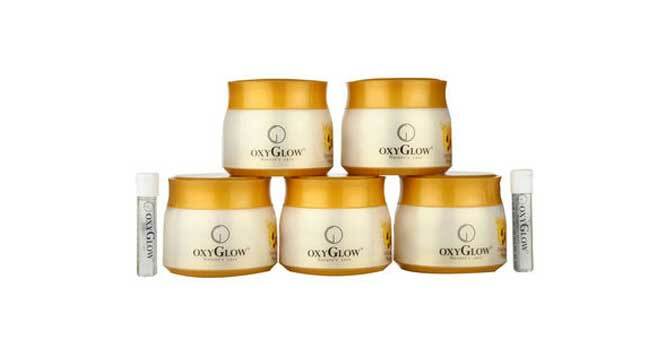 Though mostly known for its facial bleach creams, Oxyglow has now also introduced a Gold Facial Kit to give you smooth and perfect skin. The kit contains a deep cleanser cream, scrub, massage gel, face pack and a moisturizer. It contains a skin serum for extra shine and glow on your skin. A single use kit is priced at Rs. 175. 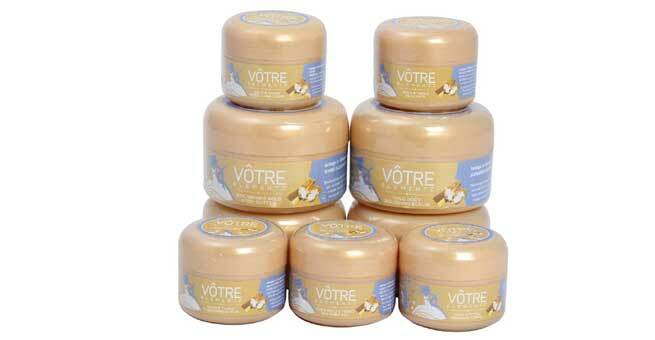 Votre Gold and Topaz Facial Kit: Gold and topaz are both precious. For the women, who feel they deserve nothing but the best, this facial kit is certainly a must have. This is a 9 piece facial kit that helps remove blemishes from your skin, lightens dark patches, corrects dark under eye area, smoothens out fine lines and softens your skin. This skin brightening product is absolutely fantastic for dull, lackluster skin. The kit is priced at Rs. 1375. 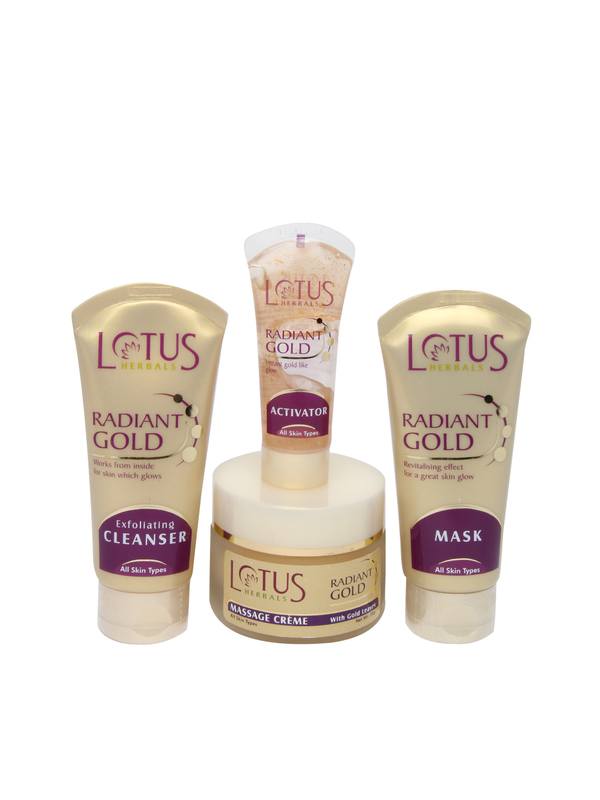 Lotus Herbals Radiant Gold Cellular Glow Facial Kit: This facial kit is suitable to all skin types and contains a gold exfoliating cleanser, a gold radiance activator, massage cream with gold leaves and a gold radiance mask. The facial kit helps boost radiance, exfoliates your skin and brightens it. It also exfoliates gently to leave you with an even texture. The massage cream is enriched with real gold flakes and replenishes radiance while the gold activator increases cellular turnover to maintain skin’s elasticity and boost natural radiance. The mask helps reverse the oxidative damage to your skin and has a revitalizing effect on it. The kit is priced at Rs. 1,250. 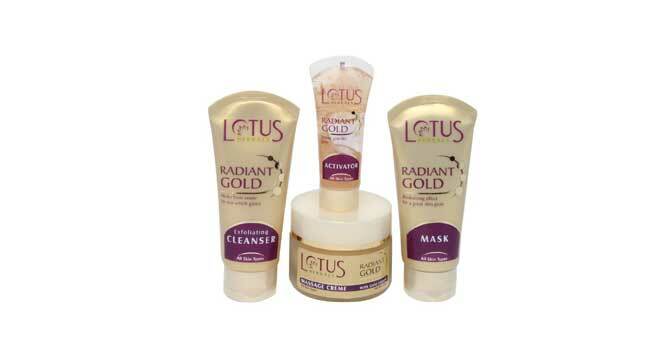 Joy 24 Carat Gold Glow kit: This facial kit attempts to purify your skin and rid it of all the toxins that damage it. The purifying ingredients help deep cleanse your skin, while the natural active ingredients help improve your complexion. By removing dead skin cells gently, the facial kit also helps you improve your skin texture and give it an overall youthfulness and suppleness. A single use pack is available for Rs. 194. 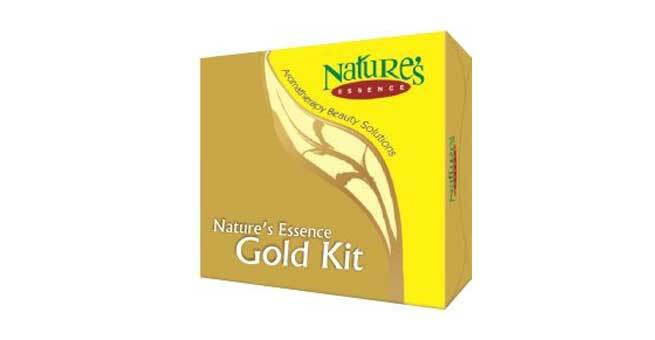 Nature’s Essence Gold Facial Kit: This kit, priced at Rs. 700, contains a cleansing scrub, pack, moisturizer, massage cream and massage gel. 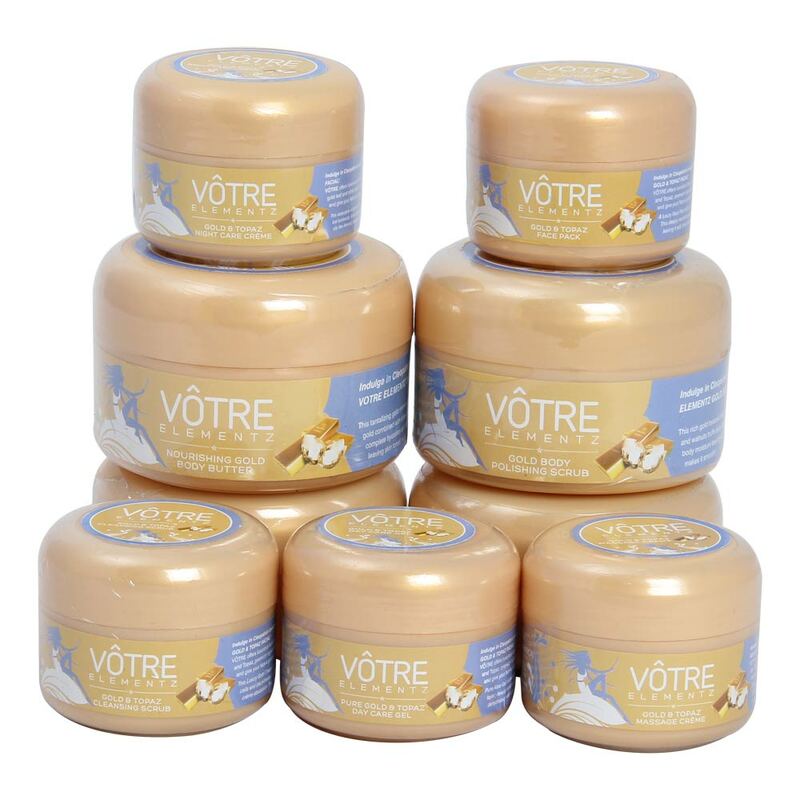 This kit is ideal for lending your skin a fresh and revitalized youthfulness. It reverses the harmful effects of pollution on your skin and helps you get your lost natural beauty back. As it removes the dead skin cells, the younger, fresher skin resurfaces, making you look younger and more radiant. The kit can be used multiple times. 100 gm pack is priced at Rs. 1200.